In this article, learn how to fix "Error 1051: A stop control has been sent to a service which other running services are dependent on" in Windows 10/8/7. This solution applies to all those services, with which you’re facing Error 1051. Services errors are quite common when you’ve to manage different services and start/stop them for various purpose. Each service in Windows behaves differently and some services may stop in single instance while there are some other services which you can’t stop in single shot. This article talks about one such case when you’re unable to stop a running/started service. This error may occur with any other service as well. Here, while you stop concerned service, it sends stop signal to dependent services. However, it might be possible that some of those dependent services may refuse the stop signal. 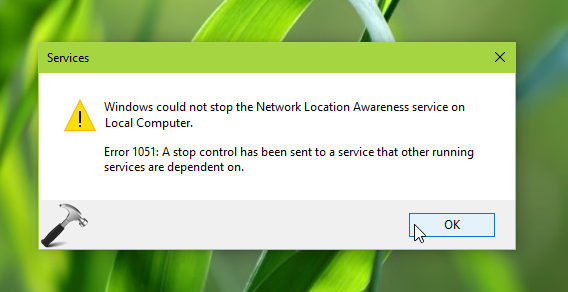 So if either of those dependent services refuses stop signal, the main or concerned service would not be able to stop and hence the error message. 1. Open Services snap-in and locate the service with which you’re facing this issue and select Properties. 2. On the property sheet, on the Dependencies tab, check the list of dependent services. You need to first stop these dependency services. 3. Once you stopped dependency services, retry to stop problematic or concerned service. This time it should stop as expected. 2. Run following command after substituting the issued service name. The service name can be found on the service property sheet, General tab. * Substitute <ServiceName> with actual service name. For e.g. net stop NlaSvc /yes. This method is quite quick and easy to stop the concerned service.